These kits are used by over 2 million consumers nationwide! You'll find this kit is perfect for single or multi-family sales and includes everything needed to make your sale a success! The 12 large all-weather plastic coated signs are bright fluorescent colors, 11" x 14" x 1/8" thick. These signs hold up to rain, wind, even snow and grab attention from multiple directions. Signs include built in directional arrows which can be filled in with the included black permanent marker. The signs mount easily to the 6 strong wood sign stakes. No need for staples, tape or glue! Simply attach the signs using the 18 double stick foam pads. Signs can be mounted single or double sided. The 1400 pre-priced color coded pricing labels stick to all surfaces, even clothing and make pricing your items a snap. Blank color labels are also included for creating your own pricing. 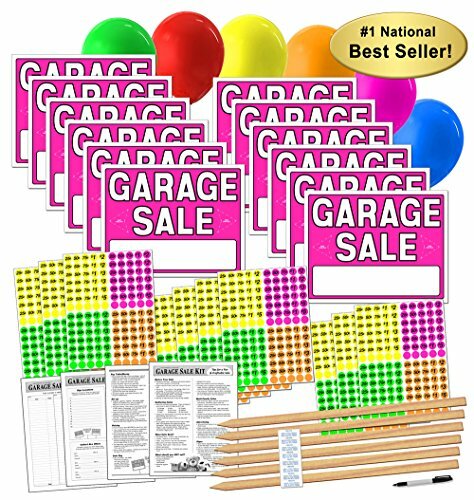 There are more than enough labels for even the largest garage sale. Whether looking to clean out your home or make money, the "Successful Tips for an Easy, Fun and Profitable Sale" will make your sale organized and professional. These are the tips from the experts in sales and marketing. Learn the best ways to prepare and the things most people forget! Since multi-family sales can be tricky to keep items separate, use the "Sales Record Form" and color coded labels to make it easy to track everyone's items. It's also very helpful for tracking expensive items at individual sales. The 6 large color latex balloons are great for getting attention, hanging on your mailbox or using as a driveway marker. Kits are Made in the USA! 12 Large All Weather Plastic-Coated Signs with Easy Fill in Directional Arrows & Permanent Marker. Signs are Fluorescent Colors & Brighter Than They Appear on Screen! 1400 Multi-Color Pricing Labels, Sticks to Any Surface, Even Clothing. 6 Quick Mount Sign Stakes, No Tools Required, Includes Double Stick Pads & Instructions. Tips for an Easy Fun & Profitable Sale. Learn the Best Ways to Prepare & Things Most People Forget. Also includes Sales Record Form & 6 Large Color Latex Balloons. If you have any questions about this product by Garage Sale Pup, contact us by completing and submitting the form below. If you are looking for a specif part number, please include it with your message.